Microscopic "holes" are characteristic in prion-affected tissue sections, causin the tissue tae develop a "spongy" airchitectur. 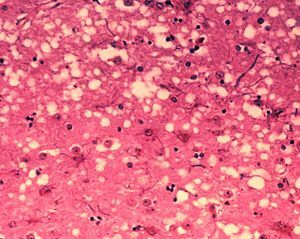 A prion is an infectious agent, componed entirely o protein, presumed tae be the cause o the transmissible spongiform encephalopathies (TSEs). This page wis last eeditit on 8 November 2015, at 23:08.